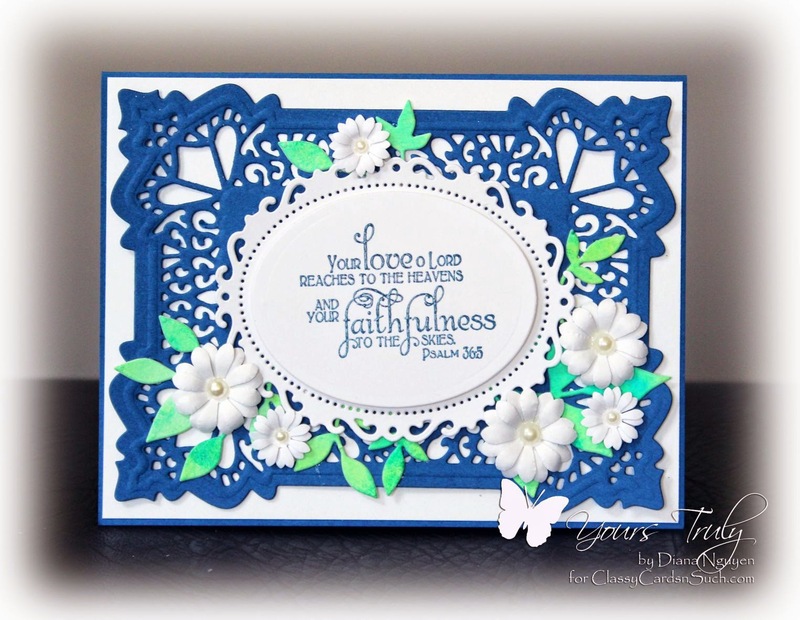 For the daisy challenge this week at Classy Cards 'n Such, I went with a blue and white color combination. I started with a blue card base, then a white one using the largest Spellbinders A2 Matting Basics A, and then a blue one using Sue Wilson Spanish Collection - Seville Die. The ornate layer was bigger than my A2 card base so I trimmed off a portion of the center. Don't worry! I knew ahead of time that I would use some embellishments to cover the seam line. My Bible verse from ODBD Faith set was stamped with MomentoLuxe Nautical Blue (my current favorite) and then clear embossed. I centered it using Spellbinders Ovals and then used small Joy! foam pads to pop it up from another die cut by Spellbinders Floral Ovals. My daisies were made using two sizes of Recollection daisy punches and curled with Paper Blossoms Tool Kit. I arranged trimmed off leaves from Memory Box Fresh Foliage as a base for my daisies as well as to hide the seam line for my shortened blue lacey layer. I then added my stacked ovals on the center of my card and then pearls to the center of my daisies. It sounds like a bunch of steps but this was actually one of my quicker cards. Die cuts are amazing!